The very personal acts of cooking and baking can be healing, entertaining, calming, inspiring, and just plain fun. My recent adventure into the kitchen and into my recipe file has been everything I could hope for — except lucrative, but I’m keeping my fingers crossed. Unfortunately, there are some days when even a well-stocked kitchen can’t entice me. 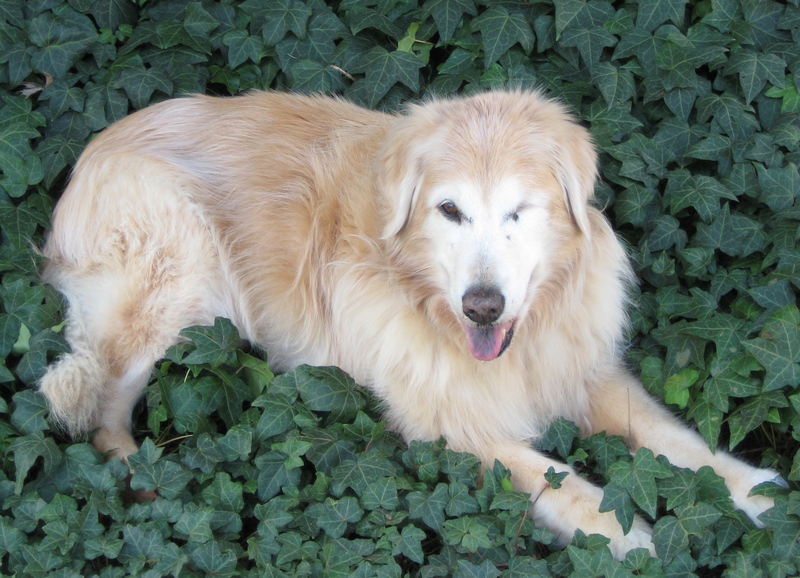 Last weekend, I took my beloved 15-year-old golden retriever to the vet’s office where I held her little head in my hands as the vet gently put her to sleep. Fifteen is a very ripe old age for golden retrievers and other large breed dogs, and Shelby was showing the various signs and ailments of a rapidly aging canine. She lost an eye to cancer a couple of years ago (hence the nickname Pirate Shelby), and the cruel beast had invaded her body once again. She had reached the end of her lifespan and no amount of tears I shed was going to change that. Shelby -- the best cure for a bad day any day. As much as my aching heart now wants the world to simply stop revolving, the nagging reality is that I still have a life to live, a job to find, a blog to write. When my unemployment crisis hit nearly a year ago, almost immediately my heart and soul gently nudged the rest of me toward the kitchen and my recipe file. Like a hesitant preteen at a school dance, I timidly began this life reinvention, revisiting old recipes and creating new ones, to help me find my balance, to give me a positive point of focus. But in the days following Shelby’s passing, the last thing I wanted to do was putter about the kitchen. I hadn’t even the inclination to make a sandwich — and I love sandwiches. The kitchen suddenly held no draw for me, as it had before; it held no allure, no hope, no promise. Because in the last 11 months, Shelby had become my trusty sous chef. At home all day for these many months, Shelby and I had bonded even tighter than before. If I was in the kitchen, she was in the kitchen — and usually underfoot. I have a big kitchen, but a large golden retriever takes a hefty chunk out of available floor space. With love, and sometimes with pot in hand, I had learned to manuever around and over her outstretched body on a daily basis — from the range, to the sink, to the fridge, and back to the range. And she never batted an eyelash. Like a well-rehearsed ballot performance, we were in sync. When the summer heat kicked in, I strategically placed a small fan on the faux-hardwood floor, directly in front of her, as she slumbered through my cooking sessions, perhaps dreaming of a bit of just-grilled flank steak or chicken thigh dropping to the floor. I’d offer her a nibble from time to time, watching closely for a glimmer of YUM! in the eye of my official taster. Now, I’m all by myself in the big kitchen, left standing alone in my reinvention. There is more floor space, but the emptiness is crushing. Finally, I had to pull myself out of the depths of despair — again — as I had so many months ago. Helping me out of my funk was the fact that I had taken a 20 ounce package of ground turkey out of the freezer on Friday — an ingredient that was scheduled to become my favorite turkey burgers for me and yummy ground turkey sauteed with fresh zucchini for Shelby. Yes, I’m one of those people. Without so much as a second thought, I fed my dogs fresh meat and vegetables, canned tuna, scrambled eggs and cheese — usually alongside a small scoop of dry dog food. Ground turkey cooked in olive oil with zucchini, topped off with a splash of low sodium chicken broth, was one of Shelby’s favorites. I like to think my dogs — Dallas, who passed away two months shy of her 16th birthday, and the equally elderly Shelby — lived as long as they did thanks to good meals made with whole food from my kitchen, and seasoned liberally with love. So, I made my turkey burgers just how I like them — with shredded zucchini, dried cranberries, and summer savory. With the other half of the ground turkey, I made a simple, quick pasta sauce that I served over farfalle — or butterfly — pasta. For a little extra zing, I topped the pasta off with a few crumbles of goat cheese, and decorated it with shards of julienned basil fresh from my garden. From now on, whenever I cook with ground turkey I’ll remember a blond, one-eyed sous chef named Shelby, whose unconditional love and devotion kept me smiling during dark days; a best friend whose companionship and healthy appetite kept me in the kitchen. 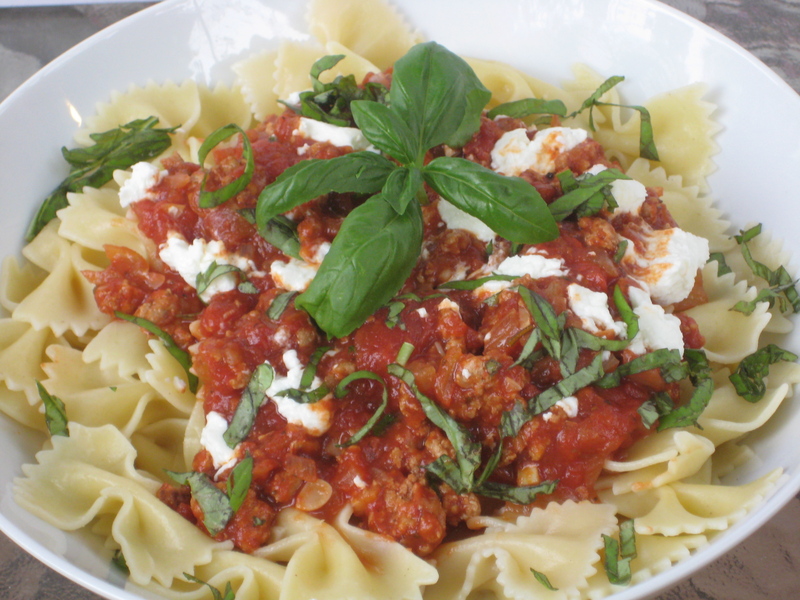 Pasta sauce made with ground turkey; goat cheese gives an extra zing! This recipe is really just a blank canvas. When you start with tomatoes, onion, garlic, olive oil and seasonings, the possibilities are endless. Let your mind wander and create your own dinner party show-stopper or new family favorite. Use ground beef in place of turkey; change up the seasonings; use white wine in place of red; leave out the meat altogether and add finely diced zucchini and carrots with the onion to introduce more vegetables to a Friday night family staple; or stir in a bit of cream cheese at the end to make a creamier, light pink sauce. Have fun and make it your own. In a large saute pan, lightly brown ground turkey in about a tablespoon of olive oil (my pan is nonstick; if yours is not, you might want to add a bit more oil); add onion and a sprinkling of salt and pepper and cook for a minute or two to soften the onion; add garlic and cook for just a minute. Add the fennel seeds and Italian seasoning and stir; add tomatoes, tomato paste and wine, blending well, and add another little sprinkle of salt. Stir and mix well all ingredients; add the sugar (to cut the acidity of the tomatoes) and allow to simmer for about 20 minutes. Taste and adjust seasonings if necessary. Serve over your favorite cooked hot pasta. Garnish with goat cheese and fresh snipped or julienned basil, if desired. Makes about 4 to 6 cups of sauce. 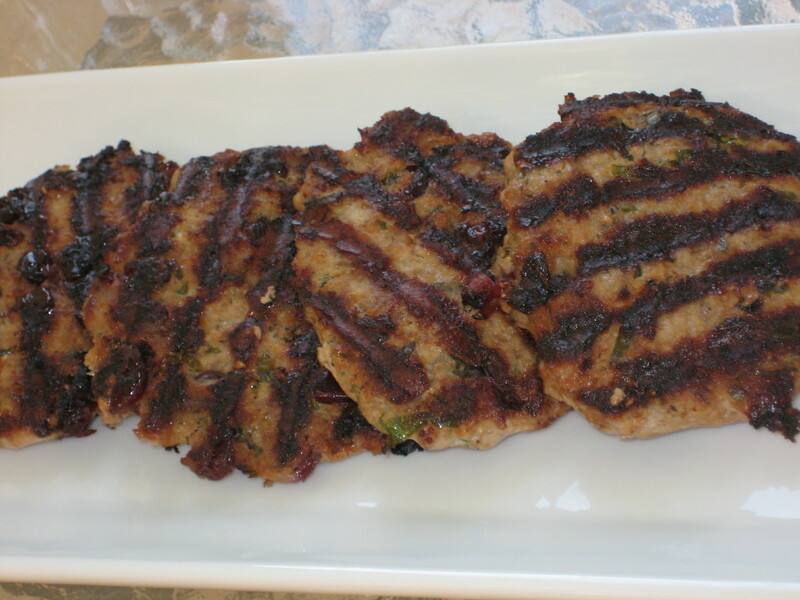 Just-grilled turkey burgers with cranberries and zucchini. You can make these burgers on an outside grill, but I’ve had trouble keeping them from falling apart. A slightly-beaten egg added to the mixture may take care of that, but I’ve decided my grill pan on the range top works just fine. I add the shredded zucchini for two reasons: to get extra veggies into my diet, and to help keep the turkey moist, as it can dry out as it cooks. I love the combination of sweet and savory — if you don’t, simply omit the cranberries. Mix the first eight ingredients together and form patties, being careful not to overwork the mixture. (This should make about 4 to 6 patties, depending on your size preference.) Brush pan with olive oil and grill burgers over medium high heat until no longer pink inside — unlike beef burgers, you don’t want anything resembling rare when it comes to poultry. Before turning, brush the top of the burgers with more olive oil to keep them from sticking. If the burger is refusing to budge to your nudging, leave it alone and turn the heat down a bit. It will release its grip when it is ready to turn. Serve on a ciabatta roll or buttery Brioche bun, with mayonnaise, a spicy mustard, and red leaf lettuce or baby spinach. Berry delicious — and nutritious! This entry was posted in Chicken / Poultry, Entrees, Pasta and tagged burgers, cranberries, dogs, pasta, pirates, sauce, tomatoes, turkey. Bookmark the permalink. Well, thank you. I’m not going anywhere. What a beautiful tribute to sweet Shelby. Your post was inspirational and touching. I will have to try the turkey burgers with the cranberries. That should tide me over until Thanksgiving! Thank you! Shelby was a sweetie, that’s for sure. The cranberry is a nutritious little powerhouse, and I add it to so many things — burgers, sandwiches, salads. It naturally goes with turkey . . . like mashed potatoes and gravy.